Card Worthy: More TE Sneaks-Wonderful Onesies and a Chance to Win! 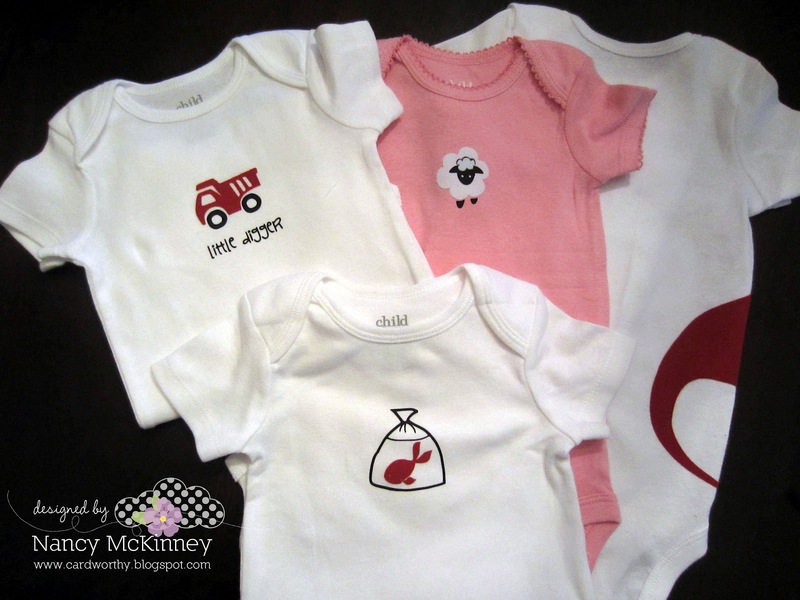 More TE Sneaks-Wonderful Onesies and a Chance to Win! I'm playing along with Taylor and her Baker's Dozen again today! I'm always excited when Taylor releases a new Moka and I'll have a card with sweet Mommy Margo and her little bundle tomorrow. Today I've focused on the new Whimsical Wishes set Onesie Twosie and the coordinating onesie die and large note card die. Too cute! 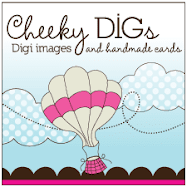 My post might seem a little long but it's worth it to read to the end...I'm giving away a freebie!! First up, for all mommies of twins who know "twins are the double the fun"...twins are referred to as Twin A and Twin B when they are first born. I'm not sure what happens when there are more multiples (C, D,...)?? 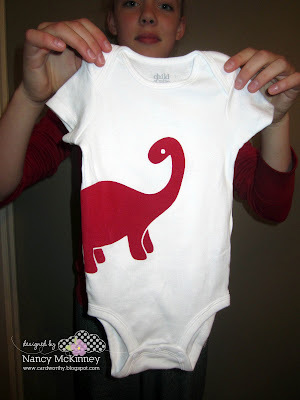 Using my stamp-a-ma-jig, I stamped the onesie, A and B images in Staz On ink on felt shapes cut with the new onesie die. A little stitching and inking on the back panels and I was done. 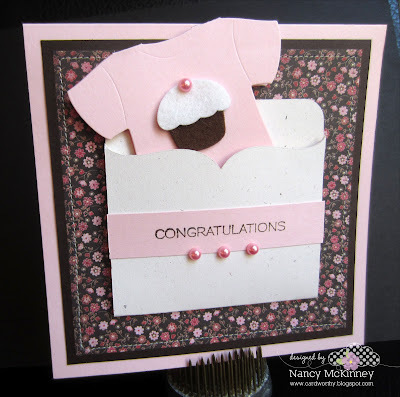 Next, I played with the new onesie note card die, which is absolutely adorable on its own. 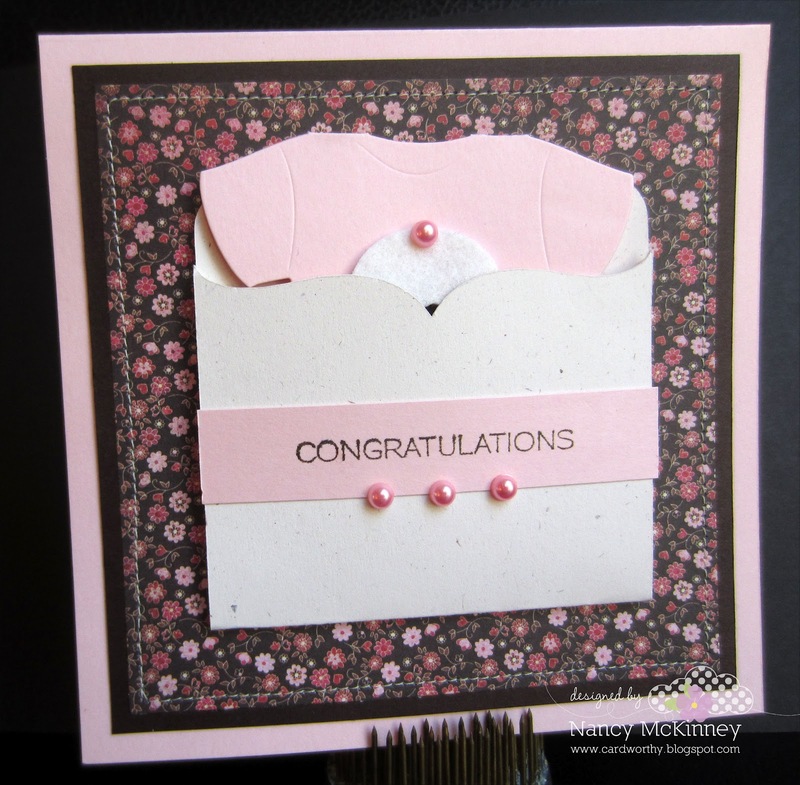 The Onesie Twosie set includes "CONGRATULATIONS" and "on your sweet little cupcake"...so what a great time to bring out the Build a Treat Tops & Bottoms die set! I created the pocket with my Silhouette and nested the onesie note inside. 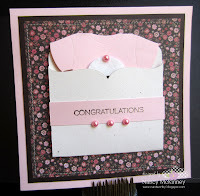 Otherwise the layout and layers are simple and clean with some stitching and a few precious half pearls. Can't wait for someone I know to have a girl!! When I was working on this week's sneak peeks, I couldn't resist creating heat transfers using some of the same images with my Silhouette and some inexpensive onesie's I picked up at Winners. 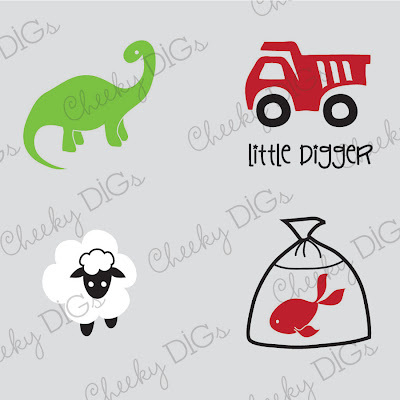 The dino and truck are from Onesie Twosie and I dug up the sheep and fish from Bringing Home Baby! 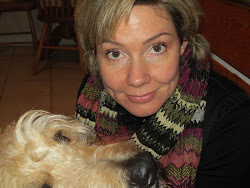 Of course, I like to share so I'm giving you a chance to win today. Just leave a quick comment and your email address before 10am (EST/EDT) tomorrow. I'll use the random integer thingy to determine our winner and send the full set of four images formatted to cut on a Silhouette. You are SO awesome Nancy! I LOVE all of these, but most especially that cupcake onesie!! OOOOOOH so cute! SUPER CUTE!!! 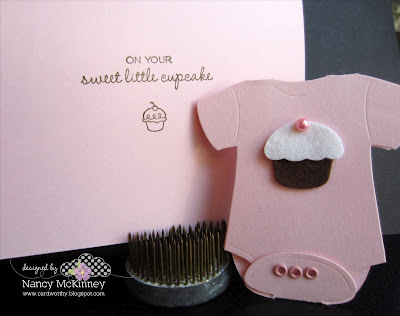 I am always in the market for baby stamp sets, so I'm all over this! So cute! I love the felt onesies, and and all the projects you did, including real onesies! Great work! really creative and oh sooo adorable! Very cute card. Love the die. WOW! Your cards ROCK, and those onesie are sooo COOL! TFS! I SO want a Silhouette! 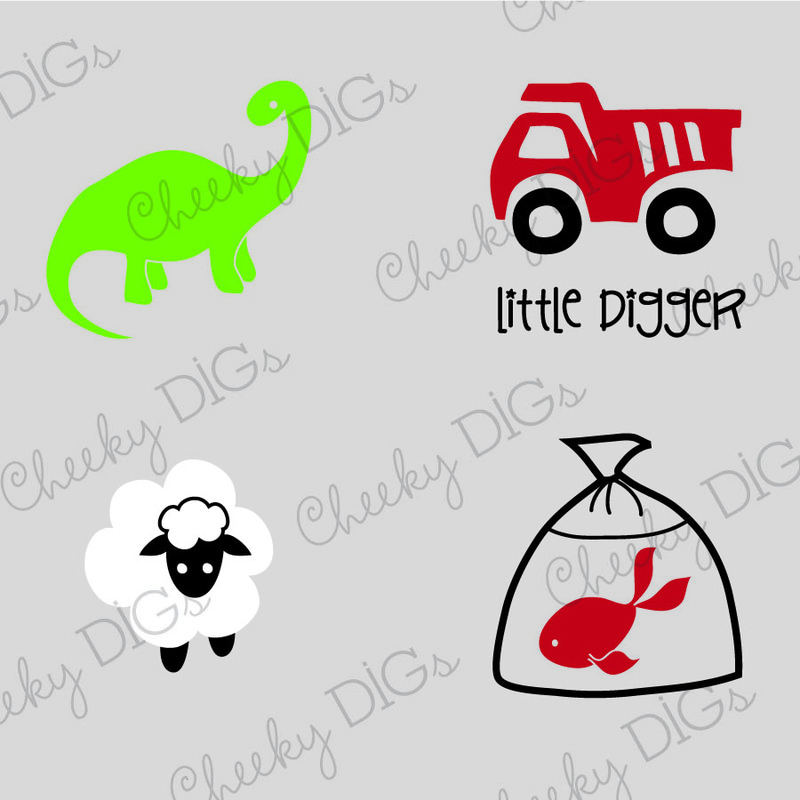 Those iron on transfers are adorable! And I love the felt onesies floating in the clouds too! 1st Day of TE Sneaks for April!